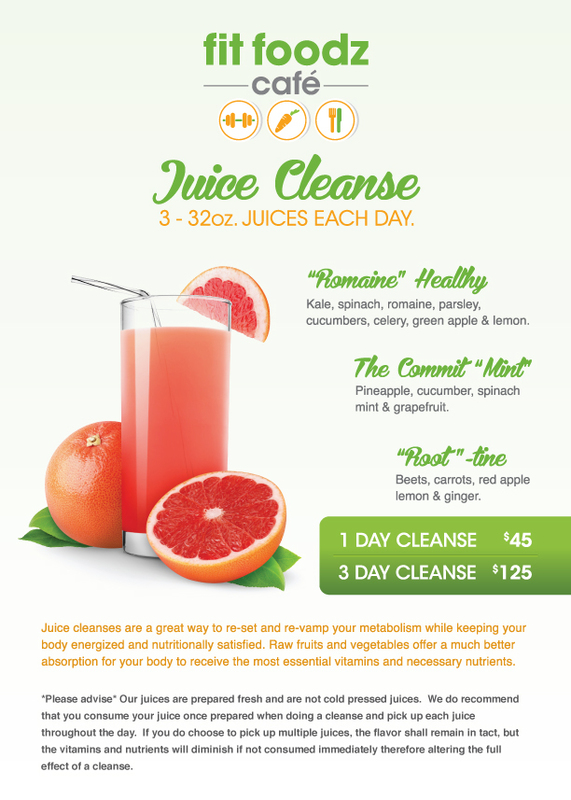 We provide three 32oz juices per day whether you choose a one day or a three day cleanse. Juice cleanses are a great way to re-set and re-vamp your metabolism while keeping your body energized and nutritionally satisfied. A juice cleanse is designed to de-toxify and heal your body by giving it a break while maintaining your daily lifestyle. We recommend if you are starting a cleanse to follow these simple steps for the best results. Consume only poached or grilled fish with steamed or lightly cooked vegetables two to three days prior. You do not want to load up your body with foods that are hard to breakdown thus causing the cleanse to not be as effective. Once you begin your cleanse you must only consume your three 32oz bottles per day. Be sure to drink plenty of water between each juice and throughout the day. If for any reason you feel hungry you may eat some raw celery and cucumber sticks. We also recommend every morning before you start your day to prepare one cup of hot water with fresh lemon, cayenne pepper, a pinch of salt and apple cider vinegar. This will help “WAKE UP” your system. Once you start your cleanse your body may experience certain detox reactions. Such reactions include fatigue, nausea, diarrhea, dry mouth and headaches. Don’t be alarmed, these are normal symptoms while doing a cleanse. This is your body’s way of telling you it is working and your system is being cleansed properly. Once you have completed your cleanse, slowly introduce solid foods back into your system. We recommend you start with salads and raw foods for the first day after you complete your cleanse and gradually work solids back into your diet. The second and third day you may eat fish or lean protein in addition to the salads and raw food items. You don’t want to introduce all the wrong food items into your diet that will undo all the benefits you gained during your juice cleanse. Now that you have completed your cleanse, CONGRATS!!! Please take this opportunity to avoid any bad habits of eating sugar or processed foods. Enjoy your new healthier and stronger self!